My spare room is south facing but the ombre quilts makes it happy! Ombre quilt, quilted with ruler work and spirals and a multicoloured binding. It sure brightens up my spare bedroom! I'm continuing to find unique ways to use up my stash. ​Stay tuned for a pattern release soon complete with colour your own pages! Ombre, Bargello and EQ7, A Match Made in Heaven! I have designed with EQ7 a new quilt to 1) use up my stash by using up my ombre strips 2) design a bargello style quilt 4) audition the colour combinations and 5) make a very accurate quilt. EQ 7 is wonderful and EQ software has been the top quilt design software in the industry for 25 years! I am happy to say I have started the quilt making process finally! See my photo below. 1/5 of the quilt is pieced!!! It will be double/queen sized. I felt like the white made the colours pop! I tried grey and they looked dull in comparison. EQ7 made designing this quilt so much easier than if I had to draw it on paper and colour it in. It is a wonderful design tool because you can decide on the size of your quilt and whether it needs sashing, blocks, colours, fabric, placement etc and just press buttons, drag and drop and voila your quilt is designed! Most of my patterns and quilts these days are being designed on this wonderful software and I hope to use it much more into the future. There is a learning curve with it and I am learning on it every time I try to work with it. I would be sugar coating it if I did not say there are challenges with it. It is a multifaceted program with lots to learn and there in lies the challenge! However, with so many design, block, sashing, border, fabric, colour and quilting options available, once you master the learning curve you have designs that you can "visually audition" and draw accurately with EQ7. Can you imagine your unique possibilities with this software? Tune in next tuesday for my next instalment of this quilt... 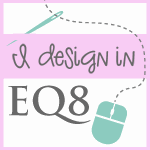 I'm hoping to get it done fast now that I have mastered the design process with EQ7! Falling in love with a colour is easy. Picking your favorite shade, on the other hand, can be difficult — which is why we love ombre! Or at least why I love it!! This hot color trend has a restful, happy affect on the eye. Colours are not busy, colours appear to glow and the colours appear modern! Check out the picture of the room below- NOT a quilt however it could be! What a lovely way to decorate a room with an ombre affect and art work. This photo is by Melanie Acevedo, from the book "Undecorate." So beautiful and I believe it really looks modern. Photo by Melanie Acevedo from the book "Undecorate"
All 4 strip sets to date...They Glow! Don't forget to use a colour tool if you try to ombre your stash and recommended is the 3-in-1 Color Tool by Joen Wolfrom available below. An absolute necessity with the two green and red value finders included in this tool! Get free ombre quilt patterns here ! Photo from craftsy.com/blog Click on the photo to get the free pattern! Happy Tuesday! Use up your stash with Ombre strips!! ? I have been very busy these days making of Roman Shades. Five of them to be exact. Two for a friend and 3 for my new quilting studio, I think I have now perfected roman shade making! I am also testing the Westalee Rulers (domestic free motion rulers) for a quilt shop in Barrie, making a sampler for them, doing custom long arm quilting, getting ready for upcoming trunk shows, teaching, some magazine work and more! Phew!! I have not forgotten my ombre project and completed another strip set for upcoming projects (which I will share I promise!!). Also, below is a quilt featured in the blog post on Craftsy from Castilleja Cotton. Isn't it gorgeous!! So one idea for ombre fabric use .... make it Bargello. ​ Just some inspiration for a chilly Thursday in March! Sorry I am behind on my posting. I will be sure to make it up to my viewers in the coming weeks after my workload settles down!! Use Creative Quilt Backs and Use Up Your Fabric Stash! Making creative quilt backs is a great way to use up fabric and your stash! Lately, when considering quilt backing fabric, I have been using up the fabric for the project on the back. It is a great, creative way to showcase the fabric, continue to work with fabric you love and use up little bits and pieces. With careful use of the fabric you can almost make your quilt reversible. The below is a recent baby quilt I was making and every single little piece of fabric was pieced together and used as backing. I knew I would not need the scraps for another project at least for a while and wanted them out of my stash! Consider making creative quilt backs and use up your stash.